Companies & retailers are working on finding ways to improve package delivery in order to solve the economic challenge that last-mile delivery represents. On 2016 we saw several retailers testing delivery by drone. 7-eleven made its first commercial delivery to a private residence in Reno, Nevada on July 11th. The convenience store partnered with tech startup Flirtey to deliver a chicken sandwich, donuts, coffee, candy, and Slurpees. Delivery robots have also been seen on the streets of Europe after Amazon made its first commercial delivery on Decemeber 7th. The package arrived safely at its destination in Cambridge, only 13 minutes after being ordered. 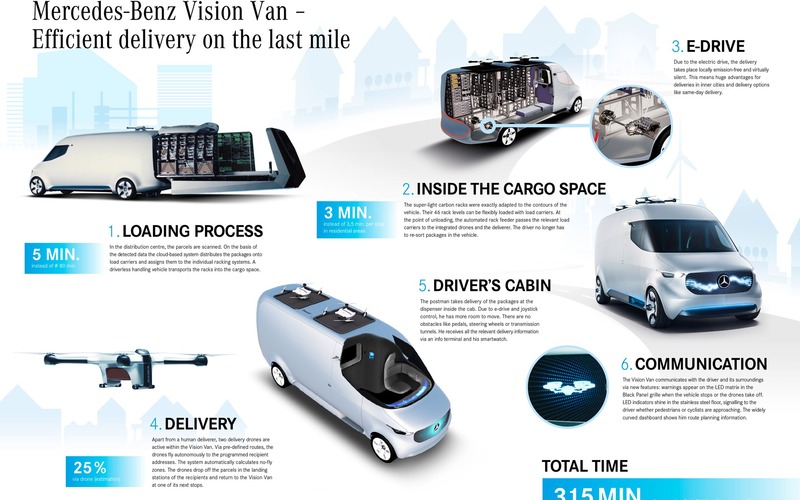 Many companies are moving quickly into package delivery made by robots/drones and one that recently caught our attention was auto giant Mercedes-Benz, who presented at the Consumer Electronics Show 2017 its intricate vision for the future of deliveries. “Vision Van” is a drone-equipped electric delivery van for online orders. The new delivery concept was created in partnership with the drone start-up Matternet and combines truck and drone technology with robotic in-truck warehousing. 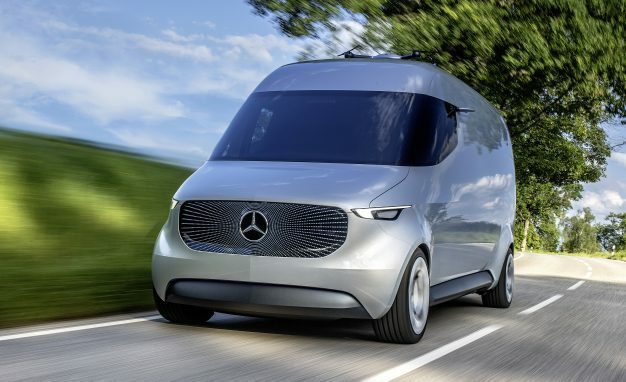 Volker Mornhinweg, head of Mercedes-Benz Vans, stated that Vision Van is a solution for the digital age and an evolution of the van into an intelligent, interconnected data center on wheels as "it is the first van worldwide to fully digitally connect all people and processes involved, from the distribution centre to the consignee,” which represents a unique approach within the van sector. The van is equipped with two internal racks, which are automated loaded with the packages in the warehouse, increasing efficiency. The system loads all parcels at the same time and organises them to make available to the deliverer the right package at the right time. Alternatively, the robot system can push the package through a window in the ceiling and into the "arms" of one of two rooftop drones, which then delivers the package to the customer's backyard. This enables faster delivery to homes that are far from the road, and makes it possible for two or three packages to be delivered at once (one by the driver and two by the drones). As it is a cloud-connected vehicle, both the delivery driver and the customer can track the delivery.